The College of Dentistry never really left Hamilton Hall. Home to the college from 1925 until classes began at our current building at 12th and Neil in 1951, every dentist who has graduated from the college the past 93 years has taken anatomy classes at Hamilton Hall. In December, several College of Dentistry offices—including the Office of the Dean—relocated from Postle Hall to the college’s next-door neighbor and former home at the corner of 11th and Neil. The move was part of the “enabling projects” that began in the final months of 2017 ahead of Postle Hall’s Phase I replacement. 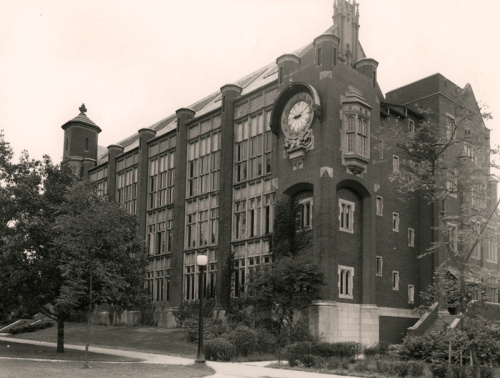 Now, the college has offices on three floors of Hamilton Hall, including the third and fourth floors where 1920’s-era dental clinic faculty and staff once marveled at the natural light afforded by Hamilton Hall’s expansive windows. With the move, the college has temporarily taken a step back in time. And while none of the building’s current occupants were at the College of Dentistry during its Hamilton Hall days, it has nevertheless been a nostalgic experience to re-settle in the college’s former home…while we wait to go back to our future.